When it comes to the issue of safety, event professionals spend way too much time thinking about how to react to an accident. Instead, this energy should be directed towards preventing the accident in the first place. Even personal protective equipment is overrated. Important, yes, but overrated. If you’re in a situation where you’re relying on the benefits of your hard-hat, fall arrest system, or high-vis vest, something has already gone wrong. To improve workplace safety at events, we need to reduce the likelihood of something bad happening in the first place. What does “near miss” mean? Beyond serving as the basis for a terrific George Carlin bit, a “near miss” is essentially an unsafe act that COULD but ultimately DOES NOT contribute to an injury or incident. Here is an example. Someone on your event crew forgets to attach a safety chain to a hanging light. Now, will that light, sans chain, fall from the grid and hurt an attendee? Maybe. Maybe not. But it is one of the unsafe acts that could contribute to it. Now think about your work sites. Think about any “near misses” you deal with everyday. Does it suddenly seem like you work in a much less safe place? Using Heinrich’s Triangle as a model, Ms. Parkinson noted that for every catastrophic event there are on average 400 reportable injuries, 20,000 minor injuries, 240,000 near misses, and more than 2 million unsafe acts. This speaks to the reality that most major injuries are not the result of 1 major failing, but rather of many tiny, unsafe decisions any one of which could have prevented the injury. One way to reduce fatalities and catastrophic events is to limit the number of unsafe acts and near misses. By reducing the number of incidents at the bottom of the pyramid, an event manager can empirically reduce the number at the top. It’s vital to establish daily procedures and habits that can help you identify these near misses. Set up Beginning and End-of-Day check-ins. Define a reporting structure during the course of the work day so concerns can be addressed immediately. Define the scope of each crew member’s responsibilities. Make note of basic safety procedures and protocols. This way, everyone can be on the lookout for something unsafe. At the end of the day, the team can review progress and set goals for the following morning. Identification is good. But change is executed in the follow through. Unsafe acts WILL happen. Our goal is to REDUCE their likelihood. For every unsafe act, identify one actionable thing that can be done to reduce its likelihood in the future. Take the safety chain example from above. If your crew is particularly experienced, solicit recommendations. This can be especially helpful if dealing with temporary structures and movable items. Remember, it might not all get solved in a day. But as long as you keep moving forward, you are making the event safer at each step. Of course, this all only works if everyone on site feels comfortable enough and empowered to identify these unsafe acts on their own accord. Especially if it something he or she did wrong. Translation? Leave the blame game at home. No shaming of your crew. The only way to fully address near misses is to create a harmonious environment in which your team members are looking out for each other. Here in lies the biggest challenge for an event manager. It is you who must create that environment. The instant one of your crew fears repercussions for speaking up, or thinks that concerns won’t be addressed, kiss the rest of your plan goodbye. And it’s no easy task. Many of your crew will be working with you for the first time with no prior track record to reference. Start this communication process in the days leading up to being on-site. Set as many expectations as you can. Hold a quick meeting before everyone gets started to highlight potential safety issues, encourage all to speak up, and reinforce your commitment to their well-being. Identify. Follow through. Build a culture. This three step approach can and will have a powerful impact on your work and the industry at large. Events are only going to become more complex, potentially more dangerous as new elements are introduced. Such a safety-centric approach is necessary to mitigate near misses and prevent the next catastrophe from ever happening. 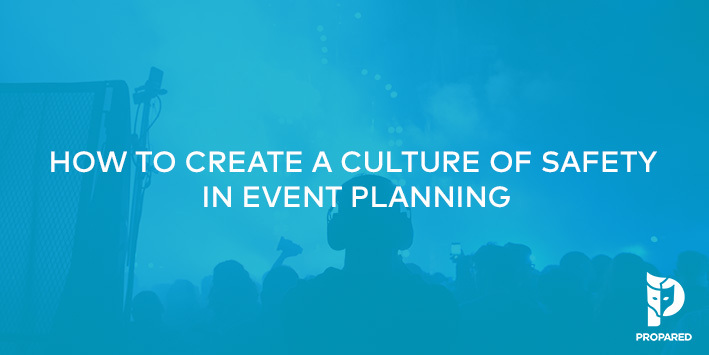 Event managers, production managers: how do you create a culture of safety at your events? Share your thoughts with us in the comments below.